It’s a stand-alone game that brings the world of Horror to the Old West, but if you want, you can play it as a straight up Western game. In High Moon – Dead Reckoning you’ll find rules for a variety of supernatural creatures as well as natural ones. What: Wild West Horror playable with any figures. Your Role: Go it alone or form a Band of Brothers. Kill some Monsters, grab some Loot, and become famous. The choice is yours in a Wild West gone mad! • A variety of Races including Humans, Vampires, Werewolves, Witches, Zombies, and much more. • Over 30 different Professions to breath life into your characters. • Rules for your characters to grow in skills and abilities as they succeed. • 30+ Attributes to further define your characters. • A quick and easy to use Magic system for you to use. • A system that generates your adventures for you. • Totally compatible with Six Gun Sound. 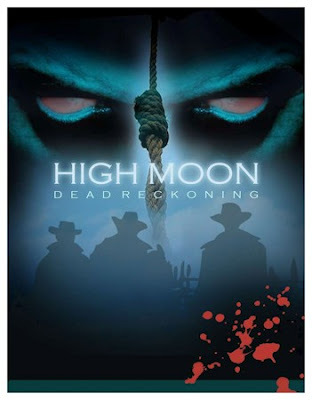 High Moon - Dead Reckoning. The game of Wild West Horror.